Jeff Betman wrote . . .
Help. I need advice on best way/products to clean my toilets. I' m embarrassed to say, but I don't get around to it much and it shows. They look awful with hard to remove stains and ring around the bowl. I've tried tons of products (Lysol toilet cleaner, bleach, vinegar) and elbow grease. Use either a phosphoric or hydrochloric acid bowl cleaner, use reasonable precautions to avoid splashes to the eyes, skin etc....Use bowl brush to push water out of the bowl and over the trap, apply cleaner liberally then let soak several minutes or longer..... scrub, rinse well(flush<G>) then use a pumice stone to remove any stains or rings still showing (use always on a wet or moist surface).... Weekly use of either scouring powder (more effective after pushing water over the trap) or a mild bowl cleaner (phosphoric acid base) will usually keep rings or stains from returning. 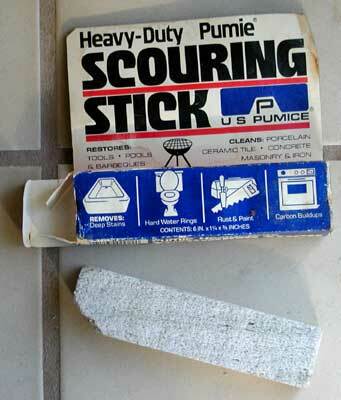 Note 1: A pumice stone is a piece of grayish white volcanic material, cut into a block similar in size and shape to a stick of butter and used as an abrasive. Note 2: Take care not to leave these acid type cleaners in the bowl for hours as they can etch the surface of the porcelain. Note 3: Hydrochloric acid can mar metal finishes, so take care not to get these cleaners on chrome parts. You really need the gooseneck kind of bottle to get at the stuff up under the rim of the bowl, so if you have a gooseneck bottle keep it until you get your new supply, and if it doesn't come in a gooseneck bottle rinse your old one and put the new stuff in it. Remember this stuff is caustic, so be careful with hands, eyes and splashing.